Wind, rain, dust and dirt can be the downfall of even the most careful and cautious photographer. Fortunately, most DSLRs have some form of internal protection with weather sealing. But don’t be fooled – weather sealing is not the same as water resistant, and it is most certainly not the same as waterproof! However, weather sealing does block out the elements harmful to the electronics in your camera – dust, water, snow and humidity. How well and how much weather sealing is in your camera varies between manufacturers and also from model to model from an individual manufacturer. Gaskets and lining comprised of rubber and silicon provide most of the weather sealing to complement the design of the camera. But weather sealing does not stop at the camera. Your camera lens needs just as much protection from the elements as your camera body — particularly the lens mount where a good seal is needed between the lens and camera body, and the moving parts where the barrel of the lens zooms in and out. While it certainly won't hurt to cover the camera and lens with a rain sleeve or cover as added protection, most cameras will be safe even uncovered if you are out shooting in the rain and snow or near a roaring waterfall for a short period of time. Water droplets on the front end of your lens will likely be the most troublesome aspect in these situations. To care for your camera and lens after very short and light exposure to these weather elements, simply wipe the camera and lens off with a soft cloth and let them dry off before packing them away. Camera manufacturers aren't terribly forthcoming about how much weather sealing is in each model. A quick glance at the spec sheet will sometimes just simply list it as weather sealed – a yes or no checked off in a column. The manuals aren't much better, as they all tend to give a standard fare under the handling precautions section. But as a general rule, the more expensive the camera is the more weather sealing it will have. 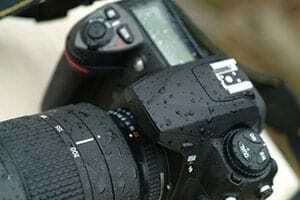 Part of the high cost of the professional grade DSLR is its ruggedness and ability to withstand a torrential downpour, a trip to the Sahara Desert, or an equally punishing climate. Further investigation is needed if weather sealing is a feature you really require. Search for a detailed diagram of the inner workings of your camera. Look for a cross section – it should outline where the weather sealing and dust protection is located. Again, keep in mind that “weather sealed” is not “waterproof”. An unexpected dunk in the river could be the demise of even an expensive professional-grade camera. Electronics notoriously do not mix well with water. A good rule of thumb would be that if you have to dig out your rain gear to protect yourself from the elements, then your very expensive camera and glass should have some protection as well. Check out this article for some ideas for protecting your gear without breaking the bank.